The start of the 2017 PWA Slalom World Tour is almost upon us and the world’s fastest sailors are preparing for a two-leg stint in Asia to kick off the year. From the 3rd-8th May Jinha Beach will play host to the creme de la creme of the racing world. The Ulsan PWA World Cup will be the first of seven events for the men and first of four for the women in what is set to be a pulsating year of racing. Situated in the southeast of South Korea, Jinha beach is a thirty minute drive from Ulsan and has developed the reputation of being the top windsurfing location in the country. 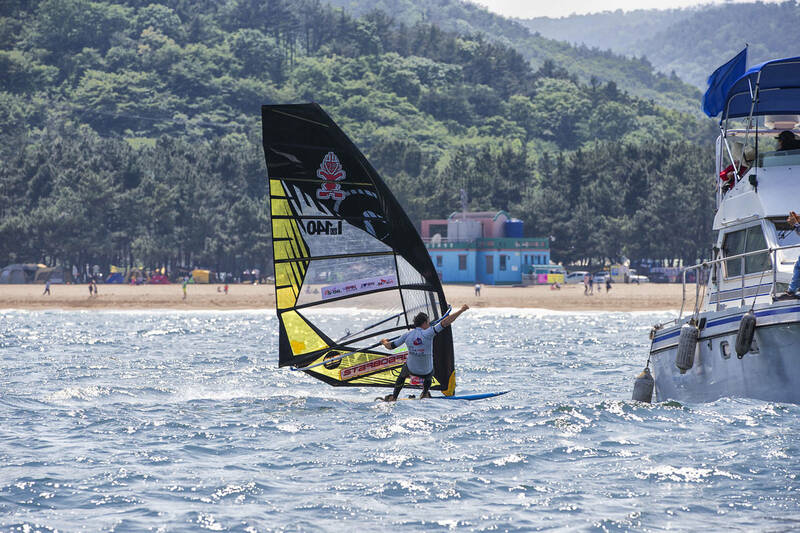 With a rich eastern culture, amazing white sand beaches and reliable trade winds, it is easy to see why windsurfers all over South Korea hold this spot in such high esteem. Jinha Beach isn’t always the easiest place to compete with sometimes gusty nature of the wind and seaweed wreaking havoc, but that’s just another part of what promises to be a fascinating start to the season. Sarah-Quita Offringa (Starboard / NeilPryde / Maui Ultra Fins) pipped Lena Erdil (Starboard / Point-7 / AL360) to the women’s slalom world title last year to earn a 3rd slalom world crown and will start the season as favourite. The 25-year-old has opted to go up in board sizes this year to help get her through the lulls and if her plan works out she’ll be very hard to stop with her blistering speed on the race course making her hard to catch. Having come so close to a maiden world title in 2016 Lena Erdil will be desperate to make a strong start to the season and she’ll have fond memories returning to Korea having won here last year. Erdil has finished as the vice-world champion in two out of the last three seasons, while she was 3rd in 2015 - could 2017 finally be the year for the 28-year-old to go one or two places better? Time will tell, but she should be heavily involved in the title race once again. Two-time world champion - Delphine Cousin Questel (Starboard / S2Maui) finished last season in 3rd place overall and she’ll be looking to secure her first world title since 2014. Cousin Questel has also changed sails over the winter - joining S2Maui - and it’ll be interesting to see what her pace is like in the opening event of the year. Also keep an eye out for the Japanese quartet of Fujiko Onishi (99NoveNove / Point-7) - 4th overall last year - Yuka Sunaga (LoftSails) - 6th for 2016 - Ayako Suzuki (Tabou / GA Sails / Mystic) and Mio Anayama (Starboard / MauiSails). Fulya Ünlü (Starboard / Point-7 / Mystic) is one of the brightest young talents on the women’s tour and she’ll be hoping to build upon 4th and 5th place finishes in the last two years. The 21-year-old showed she has the speed and the talent to be at the top of the game after scoring a bullet here in 2015 and if everything clicks into place she will be challenging for top honours over the course of the season, while fellow Turk Cagla Kubat (Starboard / Point-7) should also be in the mix. Oda Johanne (Starboard / Severne / Maui Ultra Fins) could well be the dark horse for the coming season. The Norwegian is well known for her freestyle exploits, having finished on the prestigious podium for the last 3 years running and she is now set to transfer those skills onto the race course. The 28-year-old combined training freestyle with slalom while in Bonaire this winter and she is certainly one to watch. Elsewhere, France’s Marion Mortefon (Fanatic / NorthSails) could easily be challenging for the top 5 and beyond if she can find her best form, while Esther de Geus (JP / Point-7) could also be a threat after another winter of training in Tenerife under her belt. Matteo Iachino (Starboard / Point-7 / Shamal) starts the year as the defending champion for the first time in his career and he’ll be hoping to follow up last year’s victory in Korea with another to make the perfect start to his defence. The Italian was in scintillating form last year winning 3 out of the 5 events and coming into the new season he says he’s far more relaxed than this time last year, which could be an ominous sign for his rivals. Pierre Mortefon (Fanatic / NorthSails / Chopper Fins) has been knocking on the door for the last few seasons and has finished as the runner up in 2015 and ’16. The Frenchman is undoubtedly one of the top talents on the tour and it surely seems just a matter of time before he gets his nose in front, but will 2017 prove to be the year? Ross Williams (Tabou / GA Sails / Mystic / Shamal) held off a stern challenge from Julien Quentel (Patrik / Avanti) at the end of last year to secure the final place on the heralded podium, which was 37-year-olds best result to date. The Brit will now be looking to build upon that success and continue his rich vein of form from the last couple of seasons. Julien Quentel will also be in the hunt for the podium and beyond in the opening event of the year after consolidating himself as one of the top 5 or 10 sailors in the world over the last few seasons. The 30-year-old finished in the top 5 on all but one occasion during 2016 and if he’s able to convert a few more victories and podiums then he has a genuine shot at the title. Antoine Albeau (RRD / NeilPryde) suffered a disappointing season last year, by his standards, but that still saw him ranked 5th overall. Also the manner of Albeau’s victory in Fuerteventura last year shows that he is still as hungry and dangerous as ever and it’d be no surprise to see him claim his 24th world title come the end of the year. Taty Frans (Starboard / GA Sails / Mystic) continues to go from strength-to-strength on the race course and 2016 proved to be his best year so far - 6th overall. Frans consistently pushes the starts, while possessing some of the best gybing in the world, which he uses to great affect to go through gaps that most wouldn’t even consider and he’ll be in the mix once again. Gonzalo Costa Hoevel (Starboard / Severne / Chopper Fins) jumped into 7th place for 2016 after a superb second place in Sylt, Germany, and he’ll be hoping to carry that momentum into new season, while Cyril Moussilmani (99NoveNove / Severne) will be hoping to reconjure the form which brought him so close to a first world title in 2014. Elsewhere, the likes of Italian Andrea Cucchi (Starboard / Point-7), Israel’s Arnon Dagan (RRD / NeilPryde), France’s Pascal Toselli (99NoveNove / LoftSails / Chopper Fins) - who was unfortunate to suffer a dislocated a shoulder midway through Fuerteventura when enjoying a fine season should all be in the thick of the action. The strength in depth on the world tour right now is blindingly obvious to see and there are no easy rounds and it’s almost impossible to cover everyone who can potentially challenge for the top 10 and beyond. However, it is going to be interesting to see if Ben Van Der Steen (Patrik / Gun Sails), who has changed sponsors over the winter, can bounce back from his worst season for a few years, while former teammate Cedric Bordes (Tabou / GA Sails) will also be hoping to return to the top 10. Maciek Rutkowski (Tabou / GA Sails) was crowned the Youth Slalom World Champion in 2012, but since then the Pole hasn’t really built upon that success and will no doubt be disappointed with his 27th place last year - however rumour has it that he’s been flying over the winter and it’ll be interesting if he can bring the form he’s showing at home into the competition arena. Jordy Vonk (Fanatic / NorthSails) has made no secret of his desire to become world champion and he’s another to have enjoyed a full winter of training in Tenerife. Vonk came close to a maiden podium in Costa Brava last year and broke into the overall top 16 as well. Can the 23-year-old emerge as a genuine title contender or does he still need a bit more time? The flying Dutchman clearly isn’t short on confidence and it’s going to be intriguing to see how he performs at the start of the season. With professional training camps being held over the winter this year could prove to be one of the closest battles on record and they’ll be no room for error - with any mistakes likely to be badly punished. See who shines and who crash and burns in the opening event of the year by tuning into www.pwaworldtour.com between the 3rd-8th May - here you’ll be able to follow the action as it happens via the PWA live stream, live ticker, while seeing the best of the action at the end of the day via John Carter’s images.